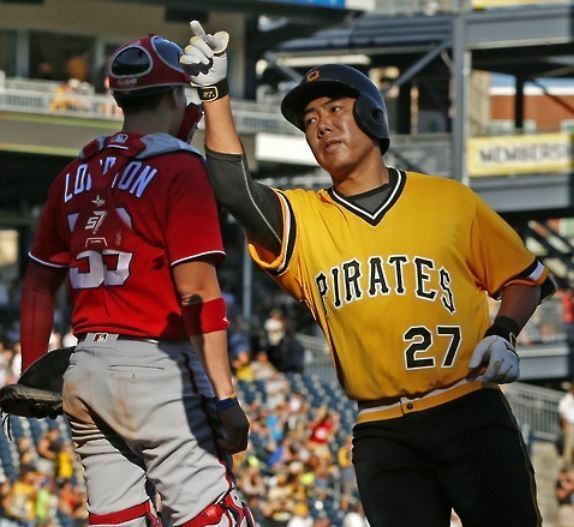 The Pittsburgh Pirates' South Korean infielder Kang Jung-ho has hit a grand slam in his second minor league game since returning to America, as he works his way back to the bigs. Starting at shortstop and batting third for the Pirates' Advanced Single-A team, Brandenton Marauders, Kang launched a grand slam in the bottom fifth against the Charlotte Stone Crabs at LECOM Park in Bradenton, Florida, on Saturday (local time). The Marauders went on to win 7-6. Kang's blast broke a 1-1 tie, and the Marauders ended up scoring five runs in that inning. The Stone Crabs responded with five runs of their own in the top sixth, but the Marauders walked off on the visitors with Hunter Owen's RBI double in the bottom ninth. Kang 2-for-4 with those four RBIs from his slam, and also drew a walk. This was Kang's second game in Single-A since being granted US visa in April. He missed the entire 2017 season and the beginning of the current season following legal trouble in Seoul. The third baseman/shortstop was arrested and charged with fleeing the scene of an accident after driving under the influence of alcohol in Seoul in December 2016. It was his third DUI arrest in South Korea, and he received an eight-month jail term, suspended for two years, in March 2017. He lost his appeal two months later. Though he avoided prison time, Kang was denied a work permit after his arrest and was unable to enter the US to play for the Pirates. The club placed him on the restricted list in March 2017 and he remains there. Kang hasn't received any pay or earned major league service time since that move. Kang tried to stay sharp by playing in the Dominican Winter League last year but was released by his club in November following an extended slump. But the former Korea Baseball Organization All-Star finally got his break in April when his work permit was issued. He reported to the Pirates' spring training facility in Bradenton soon afterward, with hopes of rejoining the Pirates this season. The Pirates are in fourth place in National League Central at 30-28, 6.5 games back of the leaders, the Milwaukee Brewers. Rookie Colin Moran has been their primary third baseman, and the 25-year-old has acquitted himself well with a .277 batting average, five homers and 25 RBIs in 51 games. The grand slam was Kang's first homer in an official game since October 2016.